M Large will be closed from 24th – 26th December and on Tues 1st Jan 2013. Normal office hours will apply between the Christmas breaks. We thank you for your business, your support and your friendship in the past year and leave you our Christmas greeting below. May the season bring peace and togetherness to and your families. May your roads be straight, your roots be strong and may everything you undertake in the coming year be full of meaning and hope. Wishing all our customers, suppliers and friends a very Happy Christmas and a prosperous New Year. Parts can be ordered up to Fri 28th December but no deliveries will be made 31st or 1st. Normal service resumes 2nd January 2013. DATES FOR YOUR DIARY: SHOWS WE’LL BE EXHIBITING AT. Showing and exhibiting our machines is a source of pride for the team here at M Large. So to give you every opportunity to come and see us (and give us a few more golden opportunities to show off our ranges) we’ve created an events calendar which we will be adding to as we move through the year. We’ve included a link to let you add our events to your calendar with one click. See the red ADD TO MY CALENDAR link below. Below is our live events calendar which you can scroll through using buttons. Have a go and if you need a hand, we’re always on hand to help. M Large have been custodians of the Stormont Estate grounds for almost 30 years and have been supplying the Christmas tree for the building grounds for many years. This year we installed a majestic Norway Spruce towering up 13m. Just look at it dwarfing our crane lorry. 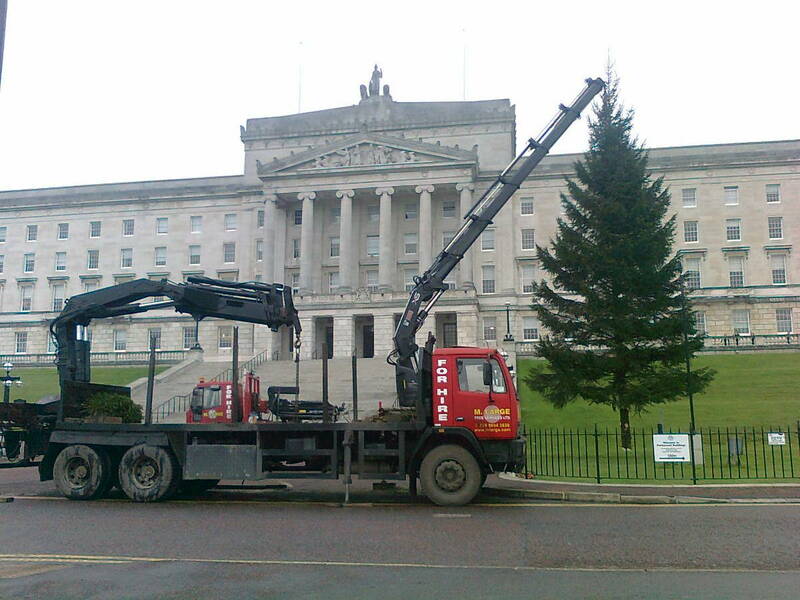 We at M Large Tree Services like to think we’ve done our bit to bring a touch of festive spirit to the Northern Ireland Assembly and the halls of power. “WE’RE SPLITTING”…TO A NEW BLOG! Welcome to our new blog. We have moved all our upcoming news from our main website to here to improve the service we offer here. A sneak peek of what we plan to offer you here.